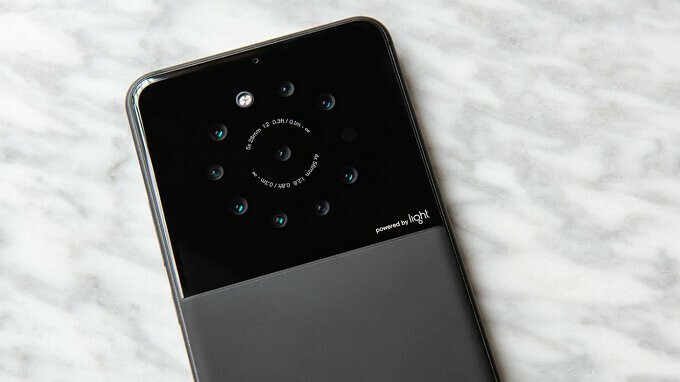 Earlier this month, we told you that Light, the company that manufacturers a camera with 16 lenses, has been working on a multi-camera smartphone. The Washington Post says that it has seen working prototypes carrying five to nine camera sensors. Such a project requires money, and we aren't sure how many L16 units Light has sold at $1,950 a pop. To help fill the till, the company raised $121 million today in a Series D round of funding. Providing the moola is the Vision Fund, which is run by SoftBank. Yes, that's the same SoftBank that owns the vast majority of Sprint (how many SoftBanks do you know?). According to a report published today, a company rep says that Light has licensed its technology to an unnamed smartphone manufacturer. The first handset to state that it is "powered by Light" is expected to be unveiled in September. Light also has a partnership with Leica which could result in the development of other consumer products. Light says that a smartphone powered by its multiple-lens technology will "shatter the expectations of mobile photography" once it is released. We just might get the chance to see if this is true sometime before the end of this year. RIP battery life.. But if the camera can beat EOS M100 (or any entry level mirrorless with APS-C sensor) and stay under $1000, it might have be a good idea. It's okay to make this phone 10-15mm thick for bigger battery. (It's still smaller size than a mirrorless). Lets hope they make a better phone than they did with the L16 camera which got very mixed reviews.